Bucerias Hotels - Hotels in Bucerias have most everything you need! All the amenities of classic beach resorts--surf and sand and sun! Many line the beautiful beaches along the bay or offer a few minute walk to the beach. Nearby are sport fishing, golf, whale watching, art walk, scuba diving and lots of culture are all highlights of any stay here. Different from many other destinations in Mexico, this area is geographically diverse and boasts mountains, jungles, beaches, rivers, nearby waterfalls and maintains its traditional Mexican roots. Royal Decameron is the only Hotel in Bucerias that offers "All-inclusive". 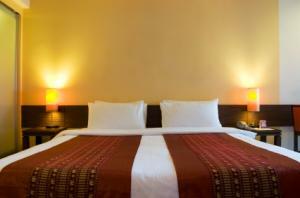 However, the remaining Hotels are great for that home away from home feeling. Some along the beach, others just a block away. Hotel Palmeras is a tropical oasis set in a refreshing combination of garden beauty and quiet atmosphere, located in the heart of the charming Mexican small town of Bucerias, Nayarit, Mexico, just 15 minutes from the Puerto Vallarta International airport. Stylish and warm, La Posada de Bucerias offers a peaceful and relaxing setting with all the comforts of home. Relax in tranquil and lush, tropical surroundings at this new, small hotel is an ideal destination for business and leisure travelers alike. NEW! - Matlali Boutique Hotel - This stunning & elegant Boutique Hotel & Villa's boast panoramic ocean views, upscale amenities like beach club, tranquil spa and onsite dining. Experience the unparalleled luxury and endless adventure Matlali offers!